Set oven control to broil. On ungreased cookie sheet, place bread slices. Lightly brush each with oil. Broil 4 to 6 inches from heat about 1 minute or until light golden brown. In small bowl, mix cream cheese and green onions. Spread mixture on toasted bread slices. Broil about 1 minute longer or until cream cheese bubbles. Garnish with thyme leaves and tomatoes. Garlic-and-herb cream cheese spread is a soft cream cheese found alongside the regular cream cheese in the grocery store. To make ahead, toast the bread and cool the slices completely before storing them in an airtight plastic bag. 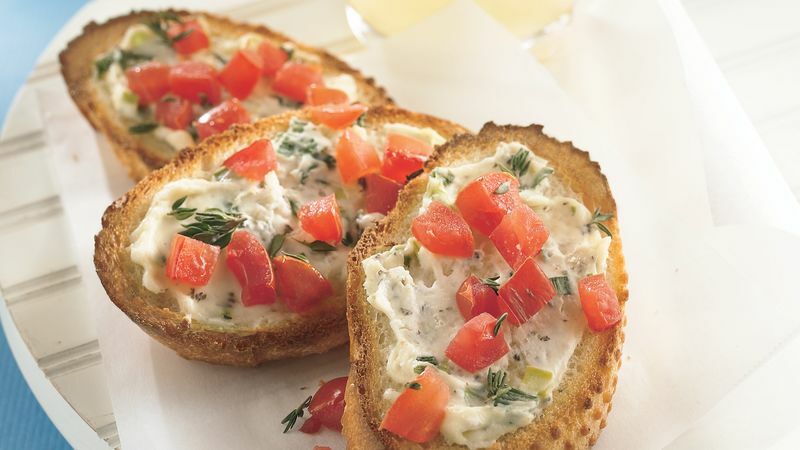 Just before serving, spread the crostini with the cream cheese mixture, and broil them.